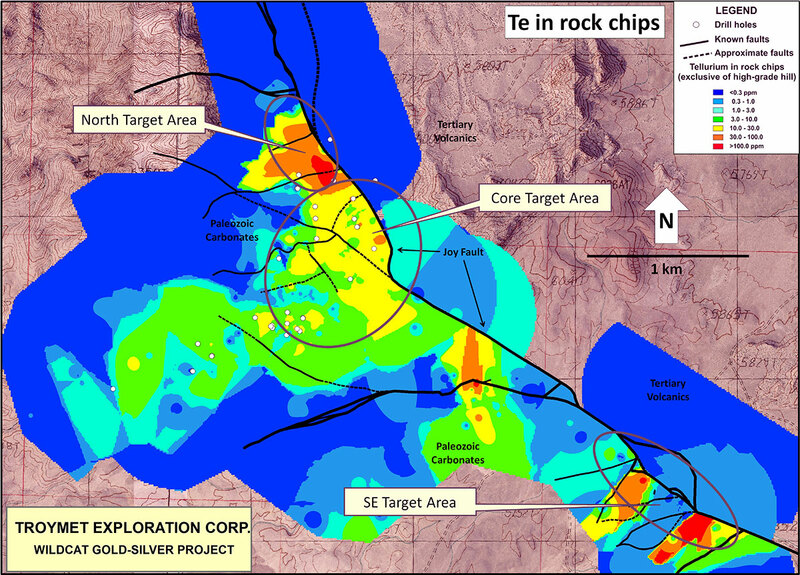 Troymet Identifies North Area Drill… | Troymet Exploration Corp.
February 17, 2016 - Troymet Exploration Corp. (TSXV: TYE) (“Troymet” or the “Company”) reports a new drill target in the North Target area on its Wildcat gold-silver project in Juab County, Utah. 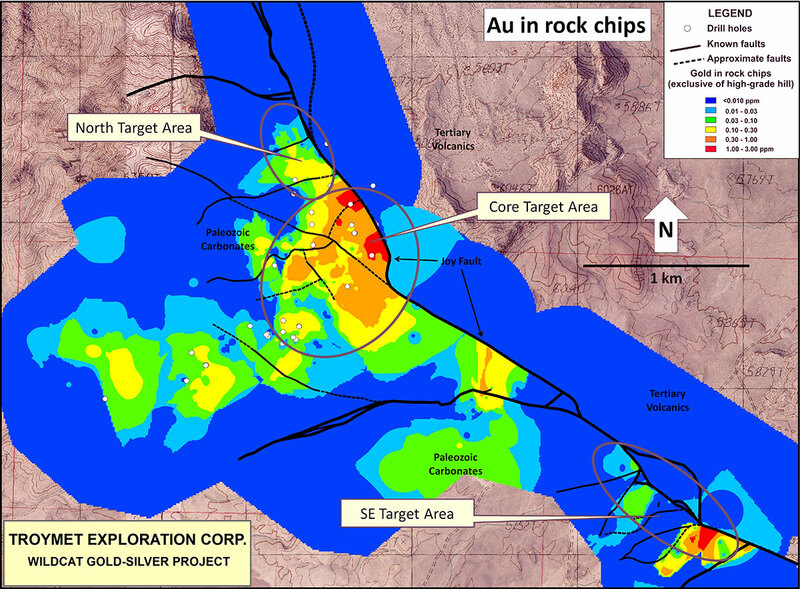 The 2015 exploration program of prospecting, mapping, BLEG sampling and soil sampling, in conjunction with detailed analysis of the airborne magnetics, identified the North Target area as a potential drill target. The target is clearly recognizable in Principal Component Analysis (PCA) of the rock chip geochemistry (Figure 1) and it has a strong gold and tellurium signature (Figure 2 & Figure 3). PCA analysis is a technique used to bring out strong patterns in a dataset to make data easy to explore and visualize. In the case of the rock geochemistry dataset (49 elements + geology), PCA analysis shows geology to be the first factor (Factor 1). 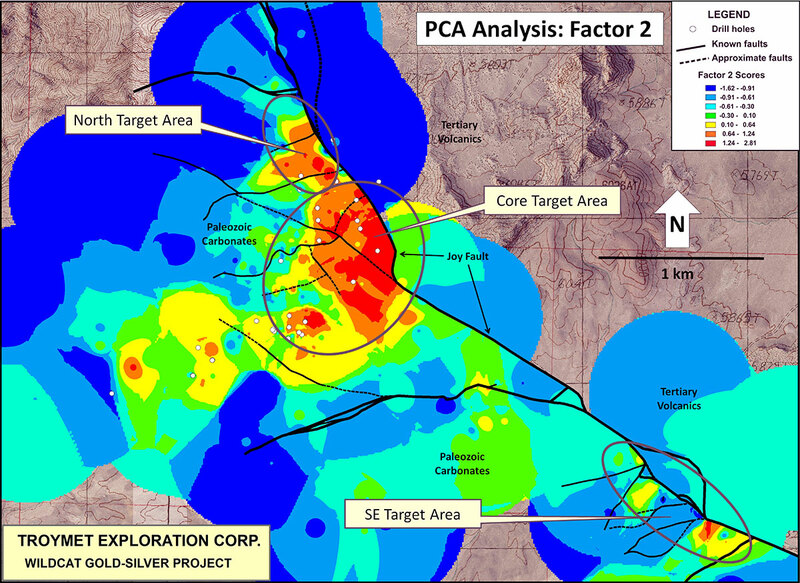 Heavy metal geochemistry comprises the second factor (Factor 2) and it shows a strong focus on the Core and North Target areas.